Looking decidedly wistful here, and anything but "grim," today's guest kicked off his major league career with a bang, going 20-6 in 1954. This earned him AL Rookie of the Year and he followed with three more years of relative success, posting a 45-21 record in pinstripes before being traded to Kansas City. His Wikipedia entry notes how arm troubles prompted a successful conversion to relief pitching, which no doubt prolonged his career in a sport where young players can fall off the planet in no time at all. 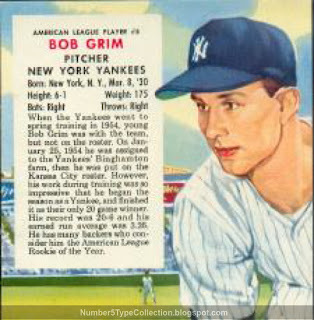 Grim's career eventually ended in 1962 with the A's, but his stats change notably after those four seasons in New York. I wonder where today's pitching strategies and medical care would've taken him, compared to the 1950s and four-man rotations. 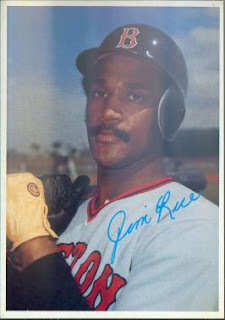 Cheer up, Mr. Rice, you’re in the Hall of Fame! Some thought you’d make it, others held you shouldn’t, and it dragged on long enough that still others debated the debating. I just marvel that your hair looks so good on TV! I read through Jim’s Wikipedia entry to better understand all of the blather and palaver. The last section calls out a bunch of interesting similarities to fellow HOFer Ducky Medwick, who played for the Gashouse Gang in St. Louis. 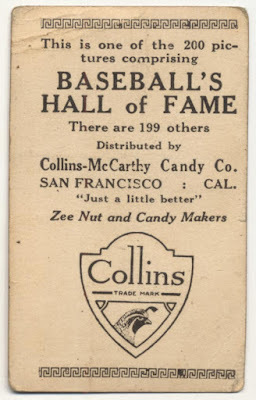 Unfortunately for Rice, people who know the political history of the Hall consider Ducky’s era (and even the Cardinals specifically) unfairly over-represented. Perhaps the linking’s meant to be supportive—their circumstances do align remarkably well—but peripheral issues take you in a different direction. All this observed, I care much for cards and not so much for the Hall itself, so hey—1980 Superstars! 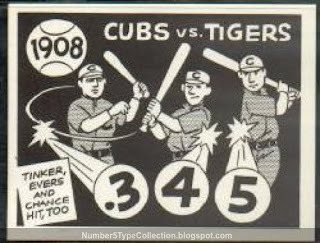 Topps crafted these 5”x7” beauties as an oddball companion to the normal 792-card set. Each paper-wrapped pack contained a handful of big, sharp photos and the checklist includes 59 of the era’s best players…and Sixto Lezcano. (Zing!) 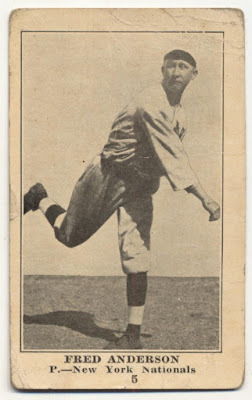 Curiously, the back states only the player name and team, a dearth of data drowning in dreary grey newsprint. Two things bother me about this issue. First, the pictures seem like spring training one-offs. Rice’s pose, a pretty uninspiring shot, looks better than 90% of his competitors. Everyone else is looking away from the camera, caught at odd angles, or just not feeling their best. Hey Topps, how about using all that real estate to show a nice action shot? Second, the card backs say almost nothing, a real waste of 35 square inches of space. 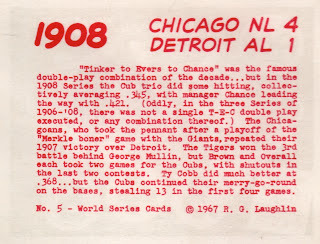 How about using them to make a big All-Star roster puzzle like they did with 1977’s cloth stickers? A few strategic changes would’ve made them super Superstars. Fred pitched his three New York seasons under legendary manager John McGraw. Apparently, he took a little something extra to the mound, frequently throwing spitters. 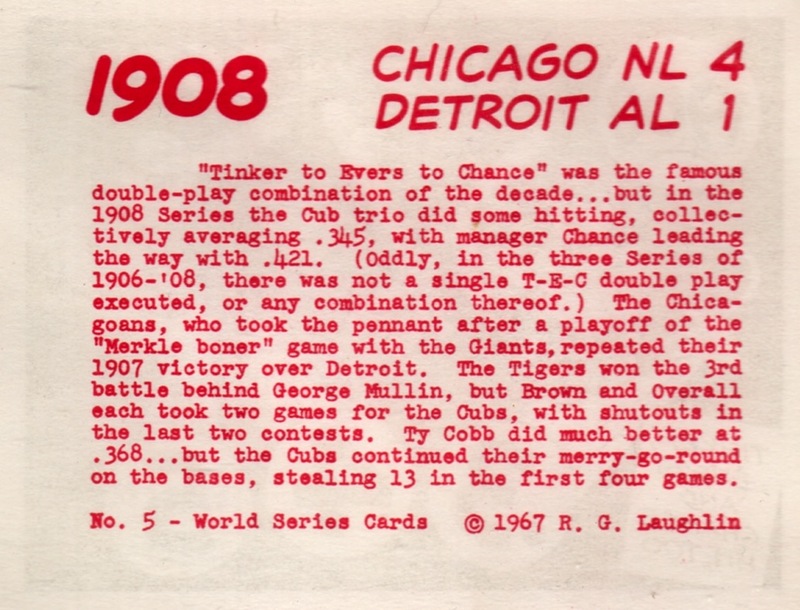 Check out this colorful account of the team’s 26-game winning streak in 1916, which includes comments on Anderson’s “moist ball” and several good performances. The Baseball Crank blog adds a more statistical bent to the amazing run of Ws, noting he started three times and no doubt appeared in several others, as one of the league’s leading mop-up men. E135 cards don’t show up very often. I finally purchased a trimmed #5 (with a blank back) from an online store last year for $30. It presents a little better in real life than what you see in the scan, given the ancient, plasticky gloss they used in the first quarter-century. 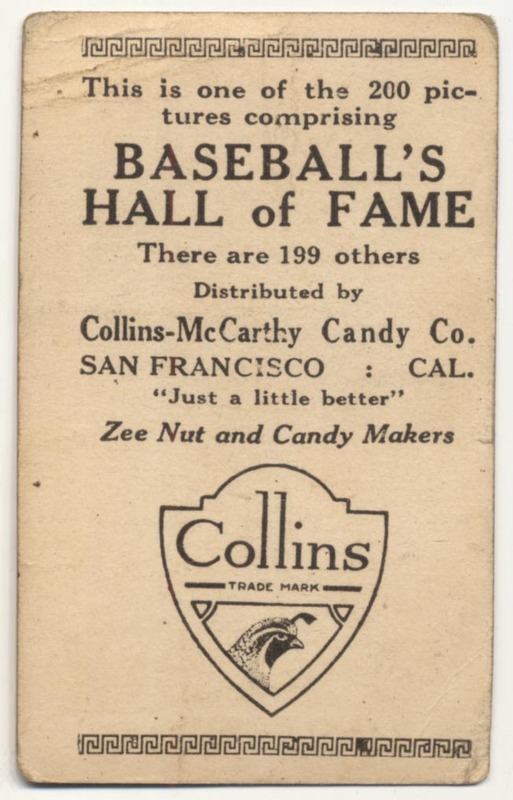 Some include an advertising stamp for the Collins-McCarthy store on the back in black ink. The whole set’s rare enough to counterfeit, something I originally feared of Fred. West Coast dealer Mark McRae helped add confidence to this particular example. Careful examination of the printing details shows the right kind of dot pattern, something handled differently by modern printers and presses. Modern gloss also holds up better, while the surface of a handled E135 appears to “fracture” into tiny pieces like a shattered mirror (or 1970s Kellogg’s card). I don’t expect PSA to ever pass judgment on Mr. Anderson, but if it happened, they’d look for similar indicators—right after cashing my large check, of course.